Japan’s Sharp has developed an 85-inch LCD (liquid crystal display) panel with resolution equivalent to 16 times that of today’s HDTV panels. 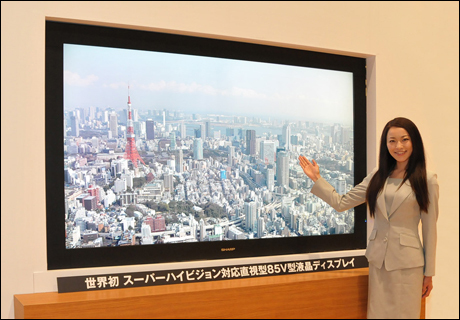 The screen, which is only a prototype, was developed for Super Hi-Vision, a next-generation television system currently under development in Japan. At 7,680 pixels by 4,320 pixels, Super Hi-Vision images will have four times as much detail horizontally and vertically than the best of today’s HDTV images. The system is being developed by Japan’s public broadcaster, NHK (Nippon Hoso Kyokai), and demonstrations of early prototypes have shown a very detailed image with beautiful colours. The images are so good, the viewer can feel immersed in a scene in a way not possible with current 3D TV technology. Because of the large amount of detail in each Super Hi-Vision image – each frame is equivalent to a 33-megapixel picture – highly complex cameras, mixing and switching systems, and recorders and transmission equipment need to be made to handle the huge bandwidth of the video image.